Level 3 Communications has cited an unspecified "configuration error" as the root cause of its nationwide network outage on Tuesday. On October 4, our voice network experienced a service disruption affecting some of our customers in North America due to a configuration error. We know how important these services are to our customers. As an organization, we’re putting processes in place to prevent issues like this from recurring in the future. We were able to restore all services by 9:31 a.m. Mountain time. Social media sites such as Reddit and Twitter erupted on Tuesday morning with inquiries and complaints about the outage from Level 3 customers, as well as customers of other big carriers like AT&T and Verizon that were affected by the outage. Speculation for the outage ranged from possible fiber cuts to more outlandish theories. Level 3 acknowledged Tuesday morning that it was aware of the issue and was attempting to fix it, and did in fact restore the network during the late morning EST. Though reports of continued issues did trickle out throughout the rest of the day, with organizations affected pointing to Level 3 as the cause of their connectivity problems. The Voice NOC investigated reports of voice service impact throughout multiple markets in the United States. The equipment vendor was engaged for assistance with investigations. No inbound or outbound calls were present in voice switches. The Voice NOC was able to implement configuration changes that were successful in allowing calls to reach the switches and process accurately. 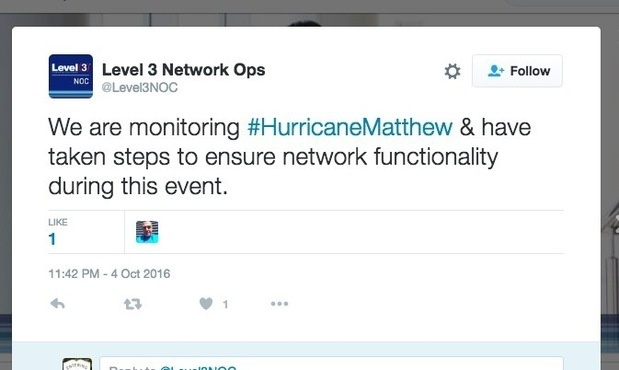 Meanwhile, Level 3 has now moved on to an even more pressing concern: Hurricane Matthew.